Lovely vintage 1980s silk jacquard 2 piece blouse and skirt set by Diane Freis. Light as air silk with Diane Freis signature mixing of 2 contrasting prints. Bright neon abstract modern art print with stars, hearts, geometric shapes, with a border of multi-colored filigree juxtaposed with a large scale black and white polka dot. 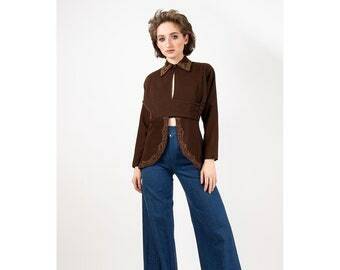 Set is simple in silhouette, Dolman sleeve blouse with elastic in the cuffs, and a drawstring waist. Skirt has an elastic gathered waist, front box pleat and mid to long length depending on height. No flaws to date, absolutely perfect condition. Set is unlined. Waist: 38 drawstring will cinch to fit.